Long needles of the eastern white pine. In December our thoughts turn to evergreens, but not usually to the pines that are so typical of our woods – our native eastern white pines (Pinus strobus). These tall pines help to create the “feel” of our woods, giving us a soft mat of long pine needles underfoot, the whisper of wind in their branches, the aroma of pine in the air, and food and shelter for wildlife we enjoy seeing. White pines are often the tallest trees in the woods. They’re named “white” for the light color of their soft, straight-grained wood. The wood made these trees valuable to early settlers as building material and ship masts, and it remains useful today. When European settlers first arrived, they found white pines that had lived 250-300 years and had grown 200-220 feet tall with trunks 6 feet in diameter. Today’s eastern white pines are usually less than 100 years old and may be 80-110 feet tall (sometimes 150 feet) and 2-4 feet in diameter. You can recognize white pines by their shape or silhouette. These trees have a characteristic flat, layered look, with large horizontal branches stretching outward. Their branches sprout from the trunk in sets of five, but over time some are lost, creating an uneven-looking silhouette. A new row of five branches grows at the top of the tree each year, and lower branches are gradually shaded out and break off. We can’t see the underground growth, but white pines are anchored by a root system that also spreads outward, rather than by a deep taproot. You can identify white pines by their long needles growing in bundles of five. (Counting needles may seem strange, but it’s not much different from noting the distinctive shapes of leaves – three- or five-pointed maple leaves, rounded or pointy oak leaves, and so on.) Eastern white pines are the only 5-needle pines east of the Rocky Mountains. White pines can entertain kids during a walk in the woods at any time of year. Kids (and adults, too) often enjoy figuring out approximately how old a small white pine is by counting the rows of branches growing along its trunk, starting at the bottom and counting up. Count one year for each row, and add a couple of extra years for rows that have fallen off at the bottom. Sometimes a young tree turns out to be about the same age as the kid doing the counting. Kids can also have fun doing a little detective work by looking at the trunk of a small white pine to see how far apart the various rows of branches are. They can decide whether the distance between rows of branches represents a good growing year with plenty of rain (when two rows are far apart) or a poor growing year, perhaps with a drought (when two rows are close together). Nature is a wonderful gateway to science. 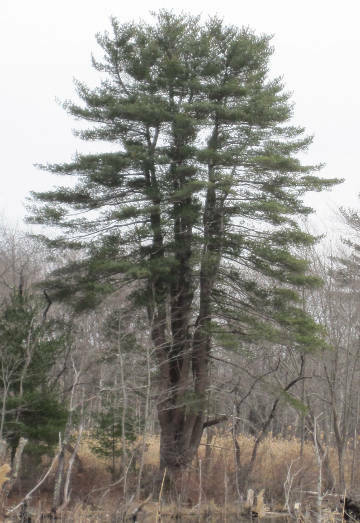 An eastern white pine growing in an old field in the Westboro Wildlife Management Area. 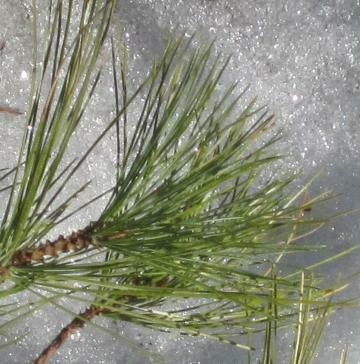 Unlike the spruces that typically serve as Christmas trees, white pines have long needles, measuring 2-1/2 to 5 inches. Needles are actually a special type of leaf. White pine needles last on the tree for a year and half. Their waxy coating helps to keep them from drying out. Their surface area is small, which also helps to prevent drying out. Thanks to these characteristics, pines, spruces, and firs stay green – and keep on using sunlight to make sugars – in the cold of winter, when most water is frozen and unavailable. In contrast, broad-leaf trees such as maples and oaks survive winter’s drought by losing their leaves and going dormant. The white pine’s resistance to drying out also helps these trees grow in dry, sandy soil. The layering of the white pine’s branches helps the tree capture as much sunlight as possible. The light is filtered (rather than blocked) as it passes through the needles and branches, reaching lower layers as well as top layers. Instead of bees, spring winds pollinate our white pines. (Think of the yellow pine pollen that collects on puddles and covers our cars, decks, porches, and driveways in the spring.) Each tree bears both soft, small, pollen-producing male cones (in spring) and long, woody, 4-8 inch female seed cones. White pines begin producing pollen and seeds when they’re about 20 years old. The seed cones take 2 years to mature, so some drop off every year in winter and spring, while others continue to mature on the tree. The cones contain about 45 seeds each. White pine seeds feed local animals, especially red squirrels, which live in pines and spruces, and chipmunks, white-footed mice, and voles. As you may have noticed, birds such as chickadees, white-breasted nuthatches, and pine warblers also eat the seeds, as do visitors from farther north, such as red-breasted nuthatches and pine siskins. In hard winters, deer may eat white pines needles, and squirrels may gnaw on the bark. Native trees tend to be used by many insects, so it’s no surprise that more than 80 species of insects feed on white pine. Year-round you (or kids you know) might discover tubes made of needles by caterpillars of the pine tube moth (Argyrotaenia pinatubana). The moth lays its eggs on the white pine needles, and its tiny caterpillars hatch and tie together 5-20 white pine needles with silk. They live in the tubes and gradually eat down the ends of the tubes. White pines also provide shelter and nesting places for many animals. Red squirrels nest in them, as do red-tailed hawks, bald eagles (at Wachusett Reservoir), and great-horned owls, which often use old hawk nests. Blue jays, mourning doves, and pine warblers also build nests in white pines. Our local bluebirds use white pine needles in the nests they build inside bluebird boxes. Raccoons sometimes rest high in white pines during the day, and red squirrels put mushrooms on white pine branches to dry. Besides supplying lumber and masts, white pines have provided people with food and medicine. One Native American name for the tree means “sap that heals.” The sap has antibiotic effects, and the needles contain vitamins C and A. Native Americans dried the inner bark – not the tough, woody, dead bark that protects the tree, but the living, inside layer that carries sugars and nutrients throughout the tree – and ground it into flour. They also used the inner bark in dressings for wounds and sores, and treated colds and coughs with tea and other medicines made from inner bark, needles, or pine sap. The inner bark also made good baskets, and long, skinny roots made cords. The sticky pine sap could be made into glue and waterproofing. Today people who are knowledgeable enough to forage for wild foods and medicine use white pine in similar ways. European settlers found white pines growing on the shores of ponds and in beaver meadows and places where Native American fields and villages had been. Through the 1700s settlers cut these trees as they went about clearing the forested landscape to create farmlands and pastures. (Recall that Westborough was incorporated as a town in 1717.) Starting about 1850, new white pines grew quickly on untended fields as farmers abandoned New England for the better soils of the Midwest or switched to factory work in cities and towns. Between 1890 and 1920, these stands of second-growth white pines were clear-cut for lumber and (in the days before cardboard or plastic) for wood products ranging from matchsticks and toys to boxes, buckets, and boot heels. Forests containing white pines have been regrowing since then. White pines are very characteristic of our central Massachusetts forests, which are basically a wonderful mix of trees that are common farther north and trees that are common farther south. For this reason, our forests are sometimes described as “transitional” forests. You can see why when you travel farther north to New Hampshire, Vermont, and Maine, where you’ll find forests filled with pines, spruces, and firs. When you go to southern Connecticut and farther south, you might notice that white pines become scarce. Our forests are also called “mixed” forests because they often contain both evergreen trees and hardwood trees such as maples, beeches, oaks, and birches. Let’s remember to appreciate our white pines at this season. Our woods wouldn’t be the same without them. Happy holidays from the Westborough Community Land Trust!